Today I'm pleased to present a guest post from Whitney of Drab to Fab Design. Whitney grew up 3rd in a family of FOUR girls! She says that growing up she and her sisters fought all the time over stupid stuff (clothes, who gets what, etc. ), but now that they're grown they are so close. She feels very strongly that family comes before everything else. Whitney is a DIY enthusiast, and redoing furniture is her passion. You can check out an entire dining set that she bought, refurbished and reupholstered for only $46 on her blog! Thanks, Whitney! 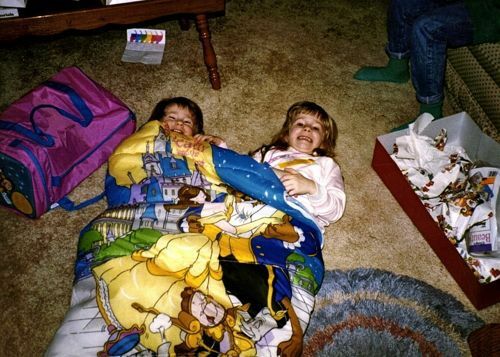 As I was rummaging through a box of old photos, I realized I spent a lot of time on the floor as a kid. I guess you could call me a floor dweller. See for yourself! 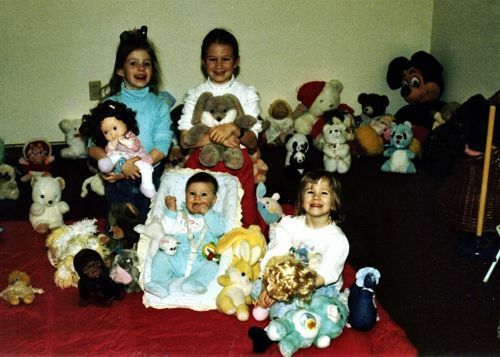 My sisters and I loved to gather ALL of our stuffed animals. Every last one of them. And we'd set them up and get them ready for our "photo session." Let's take a closer look at the picture above. I believe the giant Mickey is still alive somewhere at my mom's house. And if I'm not mistaken, it looks like there's a plunger on the right. Hmm, this is interesting, as there is no bathroom in the basement. Haha, that one will give my sisters a good laugh! 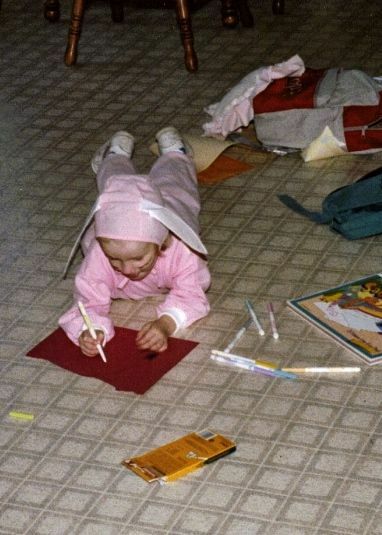 Then there's the ever so random coloring time on the kitchen floor in my rabbit costume. Fully decked out with whiskers and all. Although I'm not sure it was all that random; I think I had this costume on A LOT. I loved this thing. Clearly....it wasn't even Halloween. 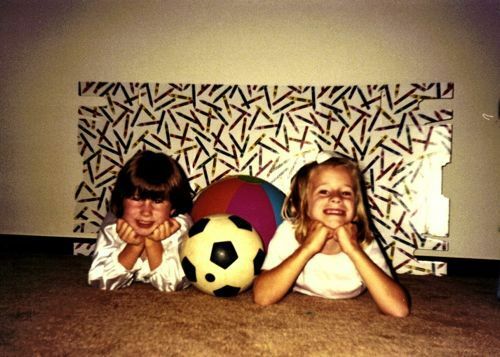 Then there was the sporty glamour shots my sisters and I set up. This Crayola crayon makeshift backdrop got plenty of use in our household. You can't go wrong with a soccer ball and beach ball, right?! When we got a little older, our neighbor would come over and borrow our clothes and we'd put on cheap makeup and try to make our hair look extra nice and go outside for glamour shots. The dog even got to be a prop. It was serious. But you're out of luck today...I couldn't find any of those photos. You see, my younger sister and I were pretty much inseparable. I liked to be "the mom" and take care of her. I was even nice enough to share my new Beauty and the Beast sleeping bag with her. We pulled this sucker out all the time. We'd set up the tent in the backyard and try to campout, but we'd run in after the mosquitoes got us. And because we were scared of the dark. Don't you wish we could just go back to that care-free childhood again sometimes?! When everyone is just trying to get Mom's attention and show her what we can do. I miss those days. Thank you so much for having me, Chelsey! I've enjoyed reminiscing over old pictures and the childhood and family I'm so blessed to have.